Do you ever do a project and it brings back unexpected memories? That is exactly what happened to me while making this mini terrarium trellis out of sticks inspired by the ones in the book Trellises, Planters & Raised Beds: 50 Easy, Unique, and Useful Projects You Can Make with Common Tools and Materials. I had the pleasure of receiving a Fairy Terrarium Kit from Horizon Group (which you can enter to win over at this post at Craft Gossip recycling along with a copy of the book Miniature Gardens: Design & Create Miniature Fairy Gardens, Dish Gardens, Terrariums and More-Indoors and Out. I had a blast taking clippings from my yard and buying a few new ones and making this terrarium, a mini garden! Well, that's where my past was brought back to me. I did a lot of mini model-making in my first career in stop motion animation. I thought it would be fun to make a mini trellis for my new terrarium. So back out to the yard for a dead branch....not too hard to find! This page from Trellises, Planters & Raised Beds was my inspiration. I started by cutting 4 branches about the same length and then just wrapped them together with wire toward one end. Then I cut little lengths of stick and hot glued them toward the bottom. I did one between each of the two sides and then joined the two sides. I simply repeated this a few more times working my way up to the top. It was beyond fun working in miniature! I can't wait to build some more little objects. Congrats to Malachy, the Best in Show this year at The Westminster Kennel Club Show! If you have a four-legged friend you love and want to make something special to honor them, why not make this paw print plaque featured in the book I Love Dogs! Activity Book: Pup-tacular stickers, trivia, step-by-step drawing projects, and more for the dog lover in you!. Click on these pages from I Love Dogs! Activity Book to enlarge and read the recipe for salt and flour clay then the directions on how to make a dog paw print plaque. Pup-tacular stickers, trivia, step-by-step drawing projects, and more for the dog lover in you! Kids are sure to have a tail-wagging good time completing the pooch-inspired activities in this activity book. Inside, kids can learn how to draw an array of favorite dog breeds by following easy, step-by-step instructions. They can also increase their canine know-how with fun-fact trivia cards, answer entertaining diary prompts, and even learn how to make doggy treats. Full of stickers, postcards, bookmarks, and other canine accessories, this book is a must-have for all dog-loving kids! More than 80 years ago, Mr. Walter T. Foster set out to prove that anyone can learn to draw. The “how to” art books he wrote, illustrated, printed, bound, packaged, and shipped on his own soon grew tremendously in popularity! Today the Walter Foster Publishing company carries on the tradition, developing books and kits that encourage creativity and spark imaginations. Dr. Grymm Laboratories presents the third annual 2011 Steampunk Bizarre Exhibit, featuring the works of 21 national and international artists that explore the unknown alternative world of Steampunk and Mark Twain. A complete Steampunk experience like no other, featuring special events, performances and interactive oddities! Opening reception will be on October 1, 2011. Funded by Hartford Steam Boiler and Foresite Technologies. So if you are into Steampunk and in the Hartford area, pop on over! Steampunk is a burgeoning counter-cultural movement; a genre, community, and art form. The Steampunk movement seeks to recapture the spirit of invention, adventure, and craftsmanship reminiscent of early-nineteenth century industrialization, in part, to restore a sense of wonder to a technology-jaded world. Packed with 1,000 color photographs, 1,000 Steampunk Creations features a showcase of stunning jewelry, fashion, accessories, headgear, artwork, home decorations, and curious contraptions. Dr. Grymm's alter ego, Joey Marsocci, proprietor of Dr. Grymm Laboratories, has been a freelance designer of theme park attractions, toys, puppets, graphic marketing, film props, and private consignments for more than 18 years. His custom contraptions and sculptures have been seen in Steampunk exhibits and publications around the world, including the Steampunk Exhibit held at the Oxford University History of Science Museum in 2010 and The Cosmopolitan Hotel of Las Vegas, NV. He also hosts an annual Steampunk art show, Steampunk Bizarre, which takes place in Hartford, CT and is the feature artist of the 2010 documentary entitled "I Am Steampunk." Visit his website at http://www.drgrymmlaboratories.net. Want to see more inside? Then pop on over to Qbookshop and hit the Google Preview button. 3-5 Lauren Andersen - The ChainMaille Lady™, will be offering a chainmaille make and take project. I hope you will come and make something with us! Also pick up a pack of free Makeready Wrapping Paper. Calling clay and gourd crafters: do you have any suggestions to help Kathy with a cracking problem on her wonderful clay Santas? Madge shares a Pink Ribbon Necklace project she created live on Jewel School at Jewelry Television! The Bead Journal Project is starting up again for its fourth year! Registration ends soon! See how to make recycled sweater and zipper Christmas trees (or hats). 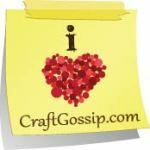 If you are in search of a special gift for a crafter or a wannabe crafter, check this collection of ideas and resources. Check out part 2 of Aileen's Pomegranate Liquor and download a freebie background while you're at it. Carmi downloads a cute Christmas graphic to make this fabric ornament. Ta da! The 10-inch-squares crocheted baby afghan is done!